The BEST recipe for rich chocolate sugar cookies! 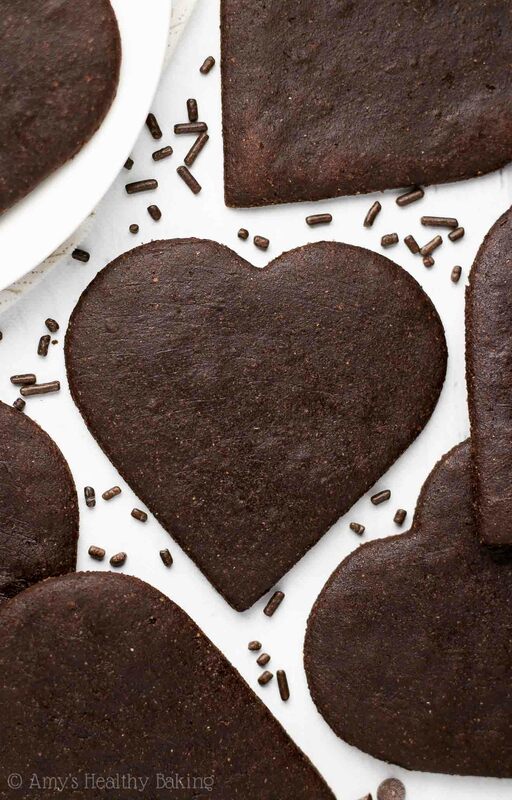 This easy recipe yields the most decadent soft & chewy cookies—but they’re just 39 calories! Last week, my neighbor texted me in the middle of her baking session. She had found a recipe online for vegan protein muffins, and before she started mixing up the batter, she already knew that she wanted to add ground chia seeds for extra nutrients. 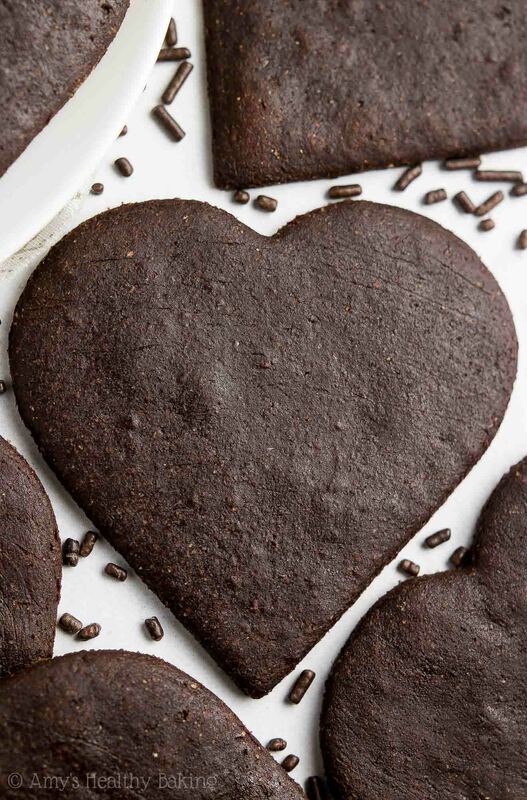 These Ultimate Healthy Chocolate Sugar Cookies! They’re soft and supremely rich, with the same extra chocolaty flavor as brownies. It’s really easy to make these healthy cookies (no mixer required! ), and they’re just 39 calories! 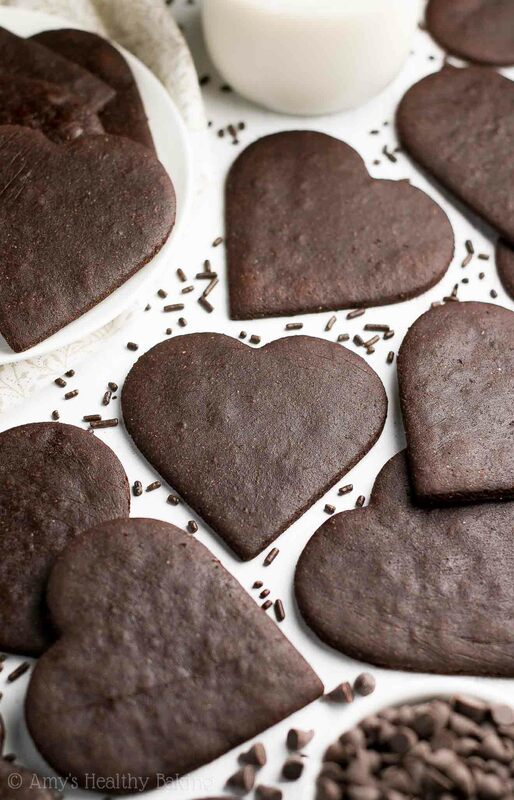 So let’s go over how you’re going to make these healthy chocolate sugar cookies! They start with white whole wheat flour (like this!) and cocoa powder (like this!). White whole wheat flour has the same health benefits as regular whole wheat flour, but because it comes from a special variety of white wheat (hence the name! ), it also has a lighter taste and texture. As for the cocoa powder, just use regular ol’ unsweetened! You’re adding almost as much cocoa powder as flour, so these cookies already taste really rich and chocolaty without Dutched or special dark. However, it’s extremely important that you measure the flour and cocoa powder correctly, using this method or a kitchen scale. (← That’s the one I own and love! It only cost $20.) Too much of either one will dry out your cookie dough and make your cookies crumbly, rather than soft and chewy. With a mere 2 tablespoons of melted butter (or coconut oil! ), I have a secret trick that gives these cookies that same rich, buttery flavor as traditional sugar cookie recipes… Butter extract (like this)! It’s shelf-stable and keeps for ages, and you can find it on the baking aisle right next to the regular vanilla extract. Once you’ve chilled your cookie dough, it’s time to roll it out! I have another secret trick for this… You’ll roll it out between two large sheets of plastic wrap! This means you don’t need to flour your work surface or your rolling pin… Which means no mess to clean up and fewer dishes to wash, too! ?? Remember to pull the unused dough away from your cut-out shapes, rather than the other way around! If you pull the cut dough out of the scraps, then that usually results in stretched-out or lopsided shapes. When you pull the scraps away instead, you end up with perfectly shaped cookies! How irresistible do those look? My little neighbor ate four as soon as I dropped them off… That’s the best kind of compliment! ? And when you make your own, remember to snap a picture and share it on Instagram using #amyshealthybaking and tagging @amyshealthybaking IN the photo itself! (That guarantees I’ll see your picture! ?) I’d love to see your sugar cookies! These are my all-time favorite chocolate sugar cookies! They’re perfectly chewy and full of rich chocolate flavor, similar to 72% dark chocolate. They remind me of fudgy brownies! Leftovers will keep for at least one week if stored in an airtight container—if they last that long! Whisk together the flour, cocoa powder, cornstarch, baking powder, and salt in a medium bowl. In a separate bowl, whisk together the coconut oil or butter, egg, milk, vanilla extract, and butter extract. Stir in the honey and vanilla stevia. Add in the flour mixture, stirring just until incorporated. Transfer the dough to the center of a large sheet of plastic wrap, and shape into a 1”-tall rectangle. Cover the top with another large sheet of plastic wrap. Chill the dough for at least 1 hour (or up to 2 days*). Preheat the oven to 325°F, and line two large baking sheets with silicone baking mats or parchment paper. Leaving the cookie dough between the sheets of plastic wrap, roll it out until between ⅛” and 1/16” thick. Carefully peel back one piece of the plastic wrap. Lightly flour your cookie cutter, and press it into the dough, making sure each shape lies as close to its neighbors as possible to minimize unused dough. Peel the unused dough away from the shapes, and place them onto the prepared baking sheets. Reroll the unused dough between two sheets of plastic wrap, and repeat. Bake the cut out cookie dough at 325°F for 7-9 minutes. Cool on the baking sheet for 5 minutes before turning out onto a wire rack to cool completely. Notes: Whole wheat pastry flour or all-purpose flour may be substituted for the white whole wheat flour. Regular whole wheat flour may be substituted in a pinch, but the cookies will have detectable “wheat-y” taste. Use a store-bought gluten-free flour blend (like this one!) for the gluten-free option, but make sure you measure it carefully, like this or with my favorite kitchen scale! You just need regular unsweetened cocoa powder, like this! 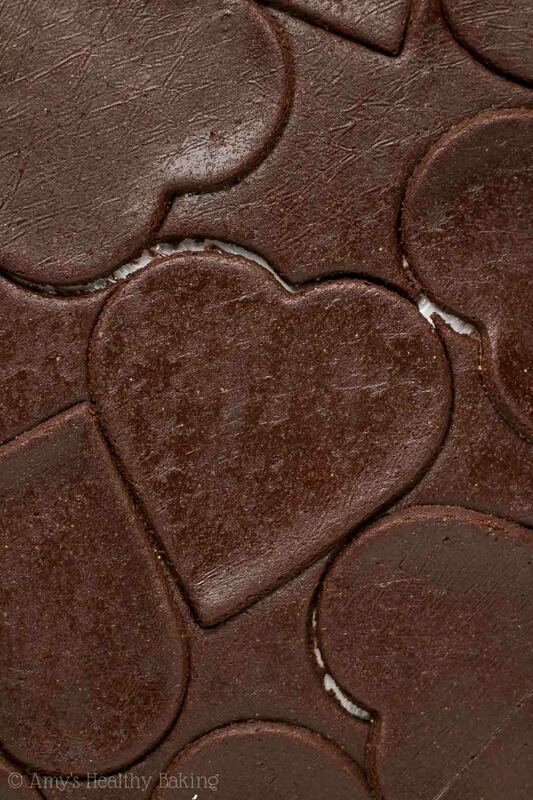 The cookies already taste very rich and dark chocolaty without Dutched or special dark cocoa powder. It’s very important to measure the flour and cocoa powder correctly, using this method or a kitchen scale. (← That’s the one I own and love!) Too much of either will dry out your cookie dough and make your sugar cookies crumbly. 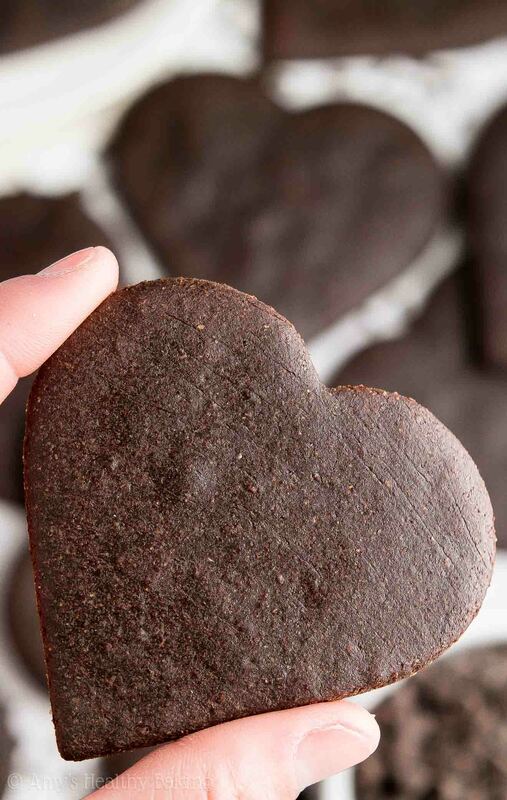 Too much cocoa powder will also make your cookies taste bitter, rather than rich and chocolaty. 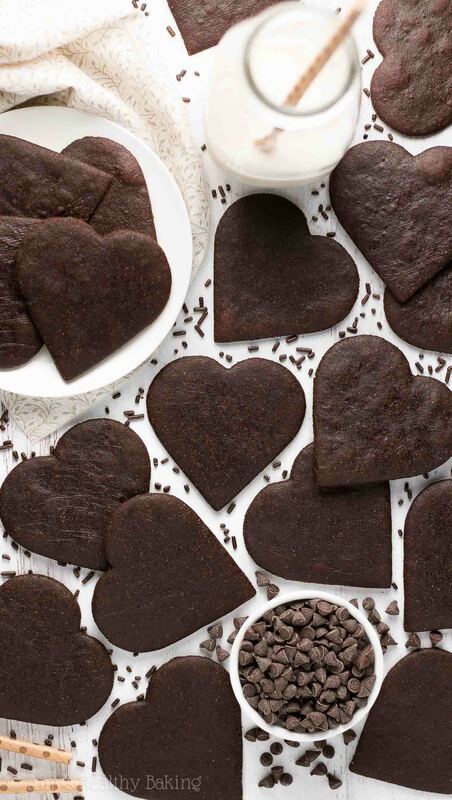 For cookies that don’t taste as dark chocolaty, substitute 2-4 tablespoons (10-20g) of cocoa powder with the same amount of white whole wheat flour (15-30g). If using coconut oil, the cookies may have a faintly detectable coconut flour. Vanilla extract may be substituted for the butter extract, but the cookies will not have the same iconic “sugar cookie” taste. This is my favorite plastic wrap. It clings SO much better than other brands I’ve tried! If chilling the cookie dough longer than 2 hours, it may be necessary to “thaw” the cookie dough on the counter for 15-20 minutes before trying to roll it out. It gets stiffer the longer it chills, so letting it rest on the counter for a short period of time makes it easier for you to roll it out! 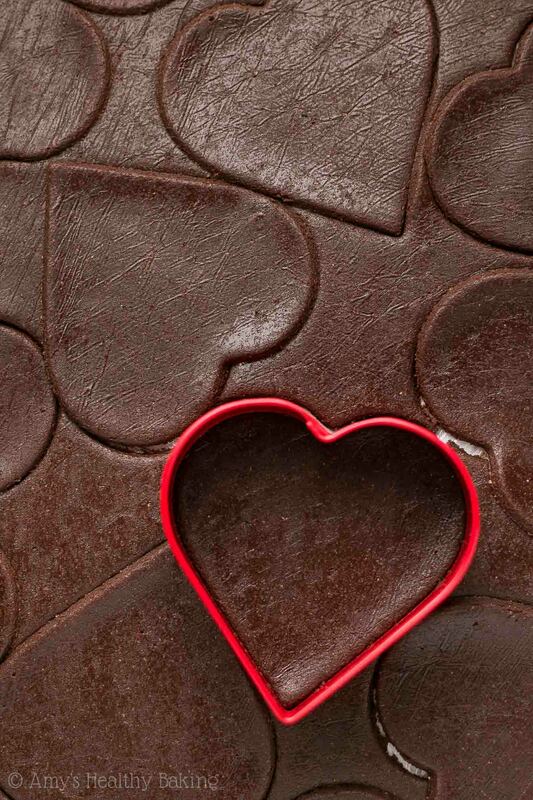 This is the heart-shaped cookie cutter that I used. I got it as part of this set! These look amazing! More like very mini brownies than actual cookies. YUM! Do you need to put butter extract? Not much of a baker so never heard of it! I really appreciate your interest in my recipe Krishma! I go over why butter extract is necessary in the text of my blog post above the recipe. (I also include other helpful hints there too!) 🙂 I can’t wait to hear what you think of these sugar cookies if you try them! Hi, as much as it might be common to use butter extract where you live, I’ve never heard of it and I bake a lot…. never saw anything of that kind in Europe…. can I just use melted butter to substitute it, or what else would you suggest? As for Stevia, I do not currently have it at home, so I wonder what other substitute you’d recommend? I have coconut sugar, agave syrup, honey and maple syrup at home currently (no regular sugar, and I do not want to use it either, nor brown which is equally bad). I really appreciate your interest in my recipe, Katerina! I actually answered both of your questions already in the Notes section underneath the Instructions. It can be easy to miss! 😉 I can’t wait to hear what you think of these cookies! I just made these! 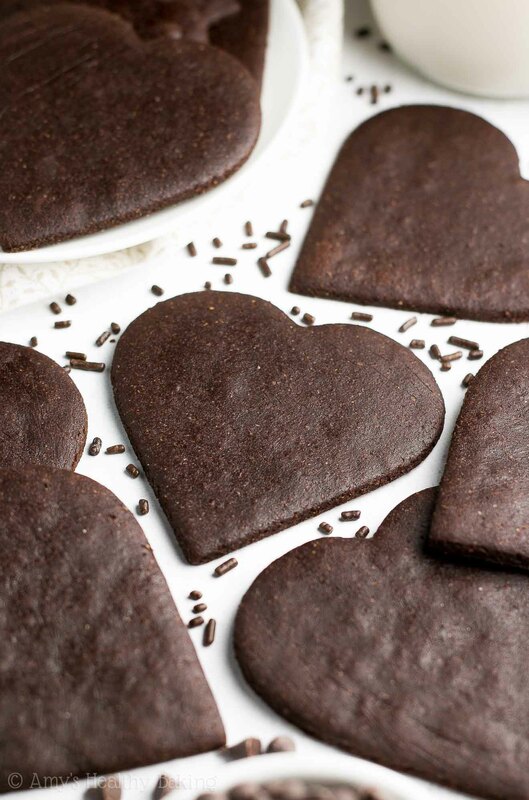 I used flax seed eggs, and carob powder, and a few other differences but they are great! I will do a few more things differently next time but I can’t eating them! Thanks Amy! Hi Amy, thanks for posting this recipe idea. Is it at all possible to increase the butter rather than add butter flavouring? Would you be so kind as to post a variation for those of us who would like to add more fats to this recipe? Another question: could we simply remove the honey altogether and just use stevia? Or is the honey a necessary component for the texture? I really appreciate your interest in my recipe Nicky! I haven’t tried adding additional butter, so I can’t personally vouch for whether that will work. You cannot omit the honey because it’s required to achieve the correct cookie dough consistency and finished cookie texture. 🙂 I can’t wait to hear what you think if you try these sugar cookies! Hi! Can other milk be substituted for the nonfat milk? Thanks! I really appreciate your interest in my recipe Erica! I’ve actually covered this already in the Notes section of the recipe (located directly underneath the Instructions). I know it can be easy to miss! 🙂 I’d love to hear what you think if you try these sugar cookies!